Holly Mason: Lisa, when did you begin your business? And where did the name “Sister Pie” come from? 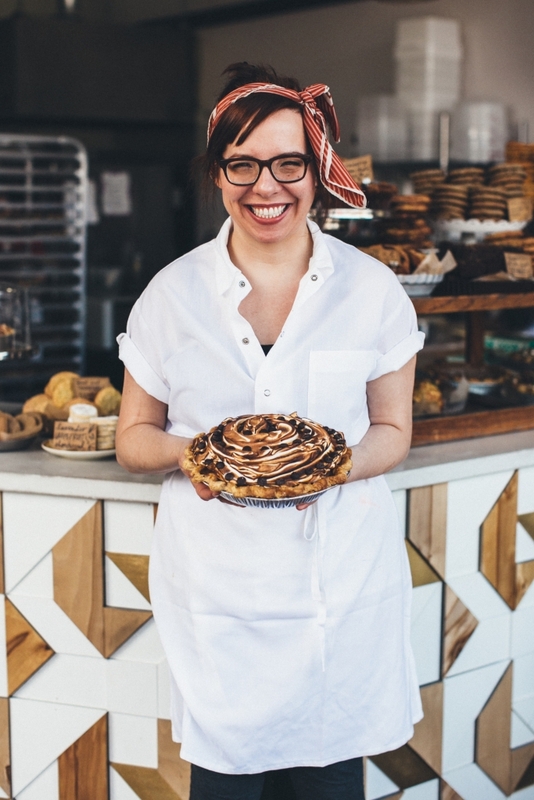 Lisa Ludwinski: I launched Sister Pie out of my parents’ kitchen in November of 2012, just before Thanksgiving. I had recently moved back to Detroit from a six-year stint living in Brooklyn. Although I knew I wanted to open a bakery/cafe of some kind, I didn’t originally set out to focus on pie. But the Thanksgiving holiday presented a great opportunity to get my friends and family to support an infant business, and what’s Thanksgiving without pie?! Thanksgiving IS pie. It all came together. And why “Sister Pie”? Well, that was easy. It’s a nickname that my sister and I started calling each other in our twenties – you know, like “sweetie pie” but “sister pie.” Now she works at the shop, along with myself and twelve other women, so the name carries deep meaning for us. HM: It’s 2017, so I wish that this question wasn’t even relevant anymore, but, in your experience, as a woman starting and owning a business, have there been any noticeable disadvantages and/or advantages? LL: You’re right, it’s definitely relevant. Because really, anything we do in our lives is still under a different scrutiny than it would be for a man. So while a lot of people might answer this question by saying “I don’t think of it that way,” the truth is: it doesn’t matter if we’re thinking of it that way. It still IS that way. From time to time, I’ll encounter someone who wants to tell me how to run my business, or give unsolicited advice, and often times that does feel like it comes from a place of sexism. But in all honesty, the advantages of my female experience have allowed me to learn how to run a different kind of business – one that can place a deep focus on trust, empowerment, and patience. HM: What advice would you have for other women wanting to start their own business? LL: Communicate clearly and unapologetically. Work with people who challenge you respectfully, and who understand and/or identify with your mission. Maintain a commitment, however small, to self-care at all times. HM: You mentioned that your shop (or you as a shop owner) make your feminist and political ideals pretty transparent. Why is this important to you? LL: The idea that you can separate politics from your daily life suggests, to me, a level of privilege that presents an issue in our country today. It’s this sort of “not my problem!” kind of mentality that leaves the disenfranchised still yearning to be free, to be equal, to be respected. I unapologetically exclaim my feminist and political ideals because I think it’s important to keep our voices alive – for ourselves and for others. Because we’ve developed a loyal following of pie lovers, we have opportunity to be open with our customers about how the political climate affects not only us and our employees, but the environment, the economy, etc. It feels like a chance to be heard, and we’ll take it. HM: “Sister Pie strives to be a triple-bottom-line business, maintaining a commitment to employees, the local economy, and the environment.” Can you tell us a bit about how Sister Pie works towards enacting these goals? LL: Our commitment to these goals will be a work-in-progress for the entire life of our business. I first learned of the concept of “triple bottom line” while interning at Avalon International Breads here in Detroit. It’s this idea that everything you do in your business should be connecting to doing good, and works well as a mission to remind yourself of in every decision made. We’re currently striving to achieve the first element by creating a thorough, clear training plan for our employees that includes plenty of information, defined expectations, and tips for success. In terms of supporting our local economy, one way we strive to do that is by creating strong relationships with other businesses in our area – farmers, screenprinters, coffee roasters, dairies, etc. We’re choosing to work with people who echo our mission, and we’re all able to support each other financially so that our businesses can have long lives. That’s one way we are committed to our economy, and I’m sure as we grow we’ll be able to identify other ways and have a greater impact. We also have a long-term goal to be something like “the greenest pie shop in America” – right now we recycle religiously and use eco-friendly, compostable disposable products for our “to-go” orders. Our next big goal is to compost all of our waste and give it to urban gardens and farms near us. We also want to be better at getting creative about how to be green – while we’re proud to use nearly all of our products, there are some items that we could probably make “in house” for a more sustainable source. HM: Part of Sister Pie’s mission is to engage with the Detroit community through community building and education. Can you tell us more about this? What are some examples of Sister Pie engaging in community building and education? LL: For one thing, we set a community table in the middle of Sister Pie so that we offer a safe, friendly meeting space for various groups, neighbors, etc. We offer pie classes each month, and in each class we save one spot to give away “on us” to someone in the neighborhood. Recently, we partnered with a local recreation center to teach a free class to young children, and that’s exactly the type of thing we hope to build into our business even more. I’m also working to start a West Village Business Group for all the business owners in the area! The hope is that through conversation and connection we can work together to grow a neighborhood that can benefit a diverse group of people. HM: And why is that engagement important to you? As a business owner, why is the greater good of the community at the forefront of your mind and business? LL: I think the definition of being a good neighbor is awareness of the neighbors who came before you and, more generally, respect of the people who surround you. If I plop my business down in a neighborhood and make all the decisions based purely on what I want and only what I want, then I’m not serving my community. Ultimately that hurts my business. We are grateful to have received good press in our first couple years of having a running shop, but that press doesn’t necessarily last forever, or come as often. It’s important for us to have a committed relationship to those who will be our customers for years to come. If they can help us realize how we should grow and change and adapt, then I feel confident that our business will have a long life. HM: Let’s talk about the goodies! 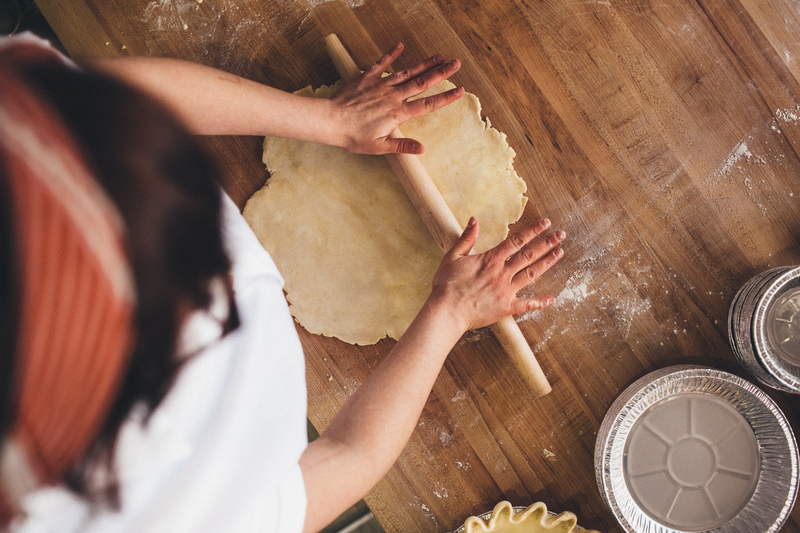 What makes Sister Pie different than other bakeries? 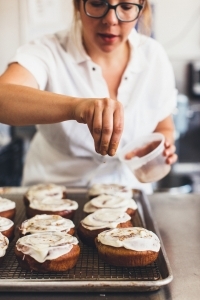 Why is it important to you that you use seasonal ingredients and alternative flours? Is it taste, is it health, is it something else? LL: For one thing, our menu is truly seasonal – there’s no apple pie in May and there’s no cherry pie in December. That takes people a little while to get used to, but usually when they taste whichever pie we have available instead, they understand. Working with the seasonal structure allows us to be super creative, too. If I know I’ve got rhubarb, then I can ask myself – ok, what will make a rhubarb pie unique? We love to pair the seasonal ingredients with herbs, floral tones, alternative flours, citrus, nuts, cheese, etc. Basically everything that’s delicious to eat! We’re also big on the sweet-and-salty. Ever had an oatmeal raisin cookie with a flake or two of sea salt on top? You’ll never go back. The reason we have a seasonal menu is simple: it tastes better. But even beyond that, it’s because of who we choose to work with. We’re not getting our strawberries from some huge farm in California that can grow them all year long – we’re getting them from Norm, who runs a small farm in Ida, Michigan. His strawberries are fleeting and delicious, and a special treat! So you can see how this ties into our greater triple-bottom-line mission, as well. We want to work with “whole foods.” While I’d never tell you that our pie is healthy because we use seasonal ingredients or organic sugar, it is more wholesome. It’s like what your grandma would make. HM: Do you have any favorite Sister Pie baked goods? My favorite pie is the Cranberry Crumble – tart fruit, flaky crust, buttery oat topping. 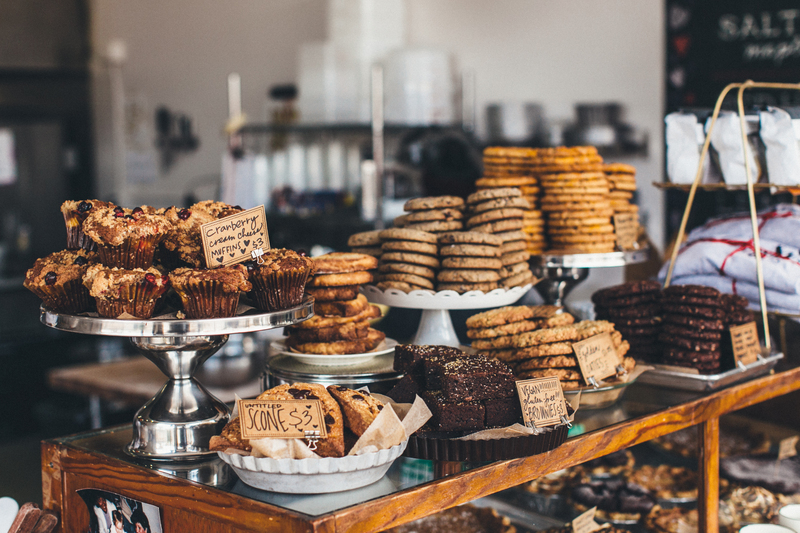 I also love the blueberry cornmeal scones, the vegan brownie, the rose pistachio shortbreads, and the golden oatie cookie. HM: What are some of your proudest moments in owning (or working towards owning) Sister Pie? LL: I felt pretty proud after dancing for 24 hours straight in an effort to fundraise our start-up costs – we brought in over $25K! 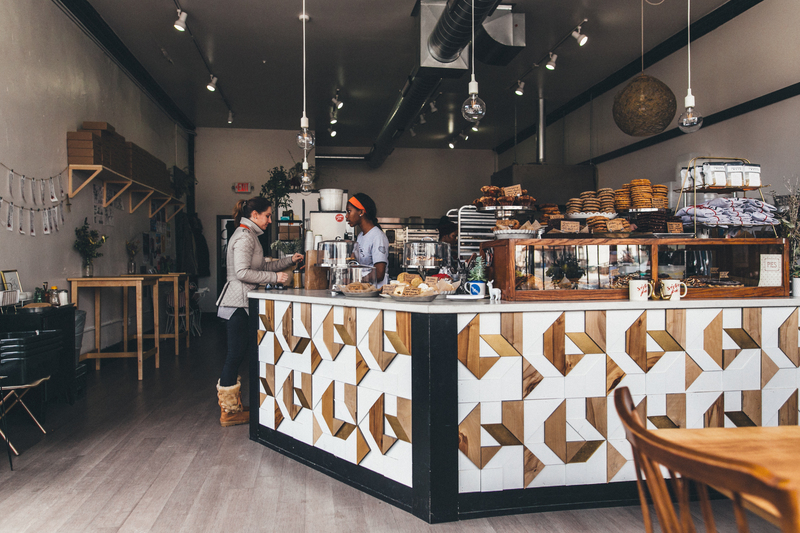 All of the steps toward opening the bakery felt intense and demanding, so the feeling we had on opening day was unlike anything I’ve felt before! Nowadays, I also feel so generally proud whenever the staff is really in sync on a crazy busy day. We work as a team and support one another, and that just sorta speaks to the whole reason we’re doing this. HM: Last but not least: What book recommendations do you have for our readers? For pleasure, last month I finished reading “Americanah” by Chimamanda Ngozi Adichie, and I couldn’t recommend it more.